For authentic-tasting Italian recipes like pizza and lasagna. Includes ingredients to make Ricotta cheese. Includes recipes booklet, cheesecloth, cheese salt, vegetable rennet tablets, thermometer and citric acid. Just used the kit. The kit explains everything step by step. It's a great learning tool for anyone homeschooling, since it is fairly easy. 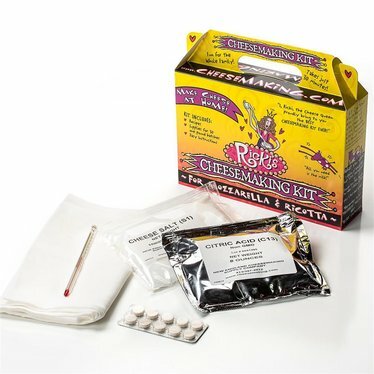 I found the kit makes cheese making simple (as can be), the directions clear. A great feeling learning some basic steps to a lost art. I was so impressed with the comprehensive instructions that I went ahead and let my 8-year-old take the lead on our maiden plunge into cheese making. What a blast! His cheese turned out beautifully, and the self sufficient lifestyle earned one more young convert.